This guidance addresses long-term contaminant management using administrative or legal restrictions called institutional controls (ICs). In many states, ICs may be used as the sole site remedy or in conjunction with other remedies, such as engineered controls (ECs). ICs, however, are sometimes overlooked as a vital component of the site remedy. Often, the long-term effectiveness of an IC is jeopardized since one or more of the critical management elements are missing or overlooked. Inadequate long-term management of ICs can in turn jeopardize the protection of human health and the environment. This guidance focuses on ICs already in place rather than on the details of selecting ICs. Properly selecting and implementing ICs, however, is essential for long-term durability and effectiveness. Therefore, this guidance provides a summary of some of the key components that are considered when choosing an IC. Also discussed are the decision-making aspects of IC implementation and planning that can affect the long-term durability of an IC, with links to additional guidance on IC selection. ITRC has also developed a downloadable tool that can help to create a long-term stewardship plan tailored to specific sites. This tool incorporates the various IC management practices presented here to assist in the early stages of site-specific IC planning. This guidance is relevant to environmental regulators at all levels of government, private and public responsible or obligated parties (OPs), current site owners and operators, environmental consultants, and prospective purchasers of property and real estate agents. Additionally, stakeholders who have an interest in a property will find this guidance helpful in understanding the elements required to manage ICs (see Stakeholder Perspectives). The terminology and process descriptions used in this guidance are consistent with those used in the Superfund Program. Some state and tribal governments have brownfield programs within their Superfund network; the terms and processes used in these brownfield programs may vary from those used here. LUCs are meant to protect human health and the environment given a site’s current or anticipated change in use. LUCs are a type of site remedy used when residual contamination precludes unlimited use/unrestricted use (UU/UE) of the property. There are two types of LUCs: ECs and ICs (ITRC 2006; USEPA 2012). 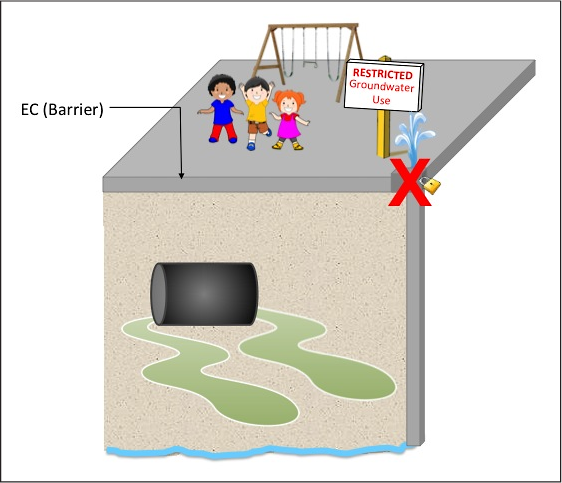 ECs are physical controls or barriers that prevent human exposure to contamination (see Figure 1). These controls limit direct contact with contaminated areas, reduce exposures, and control migration of contaminants through environmental media. Examples of these controls include fencing, capping, vapor mitigation systems, containment, slurry walls, extraction wells, and treatment methods that minimize the spread of contamination. Figure 1. Examples of an EC for groundwater contamination (locked well). ICs are administrative or legal controls that prevent unacceptable human exposure to contamination or protect the integrity of an EC by limiting land or resource use. ICs can supplement ECs, or they may be a stand-alone response. For example, an asphalt cap that covers contaminated soil might be supplemented with an IC that prohibits residential use of a property or disturbance of the cap. An IC may also be used without a corresponding EC. For example, a land use restriction may be applied to a property to prohibit its residential development due to potential exposure to residual soil contamination. Whether an IC alone is sufficient, or whether both an IC and an EC are needed, depends on regulatory requirements as well as site-specific conditions. For example, when contaminated groundwater exists but is not in an area with a drinking water well, an IC to prohibit the installation of drinking water wells may be appropriate. On the other hand, if groundwater contamination exists in an area where drinking water wells are in use, an EC such as a slurry wall or pumping wells to provide hydraulic control of the plume may also be required. See ITRC’s LUC guidance for more detailed information on ECs (ITRC 2008). Governmental controls rely on the regulatory powers of a state or local government and include, for example, existing ordinances, building and development rules, environmental restrictions, and other restrictions on land or resource use. Common examples include zoning ordinances (which limit or condition the type of land use that can occur in defined zones), groundwater use or well drilling limitations, reuse of contaminated soils generated from IC areas, and land development regulations. Government controls may involve preexisting ordinances relied on by a cleanup remedy or, in some cases, newly drafted governmental controls, such as ordinances limiting deep excavation in known areas of soil contamination, can be drafted specifically for use as an IC. By their nature, government controls tend to affect larger areas – such as the entire boundary of a given jurisdiction (for example, a city boundary) or a region within a jurisdiction (such as a contaminated groundwater overlay region). Government controls can be enforced by the jurisdiction that enacted the control. Proprietary controls are the most common type of control. Other types of ICs in lieu of, or in combination with, proprietary controls often prove effective at large sites or where landowners are unwilling to agree. Proprietary controls usually affect a single parcel of property and are considered proprietary, or private, because they are established by a private agreement between the landowner and an outside party. This outside party can, in turn, enforce the restrictions or limitations provided in such agreements. Proprietary controls are created under the authority of state real property law; thus these agreements constitute a property right. These controls are attractive because they “run with the land” – meaning they endure as the affected property is sold to new owners. Proprietary controls are sometimes called “deed restrictions,” which is a general term used to describe property rights that restrict the use of the property. Common examples of proprietary controls include restrictive covenants, environmental covenants, or easements that restrict use (also known as negative easements). These covenants or easements are typically multipage documents that describe the property affected and the restrictions imposed (for example, excavation prohibitions or well drilling prohibitions). The controls are recorded in the official land records so that they can be found under conventional title search procedures. The state law authorizing proprietary controls varies. Nearly half the states have enacted statutes modeled after (National Conference of Commissioners 2003), which authorizes and helps assure that these types of controls can be enforced. Other states have enacted similar statutes, but not modeled after UECA. Finally, some states rely on the state common law (meaning law set by decisions over time, rather than state statute, over many years) for their authority. Regardless of the authorizing law, flexibility often exists as to the outside party (or parties) to the proprietary control agreement that can enforce the control. The outside party is often the state environmental agency, though it need not be. Because each proprietary control affects a single parcel of property, when cleanup sites involve multiple parcels it is usually necessary to draft and negotiate proprietary controls for each parcel. While proprietary controls are the most common IC, at large sites or where landowners are unwilling to agree to proprietary controls, using other types of ICs in lieu of or in combination with proprietary controls often proves effective. Enforcement and permit tools include government agency-issued permits, administrative orders, and enforcement agreements (such as consent decrees) that are enforceable by state or federal agencies. These tools can include requirements that restrict future land use. Rather than being a property right (as for proprietary controls), most enforcement and permit tools are binding on only the signatories to the agreement (or the party named in the permit or order) and, therefore, the property restrictions do not bind subsequent owners (they do not “run with the land”). Deed notices are documents filed in public land records with the property deed that provide information about potential health risks from contamination left on the property to the future buyers or other interested parties. They do not direct action and are not enforceable. State registries of hazardous waste sites contain information about contaminated properties. Some state laws provide that the use of the registered property cannot be changed without state approval. Advisories warn the public of potential risks associated with using contaminated land, surface water, or groundwater, and are usually issued by public health agencies. Widespread IC Use. ICs are widely used: more than 61% of the survey respondents reported 200 or more ICs in their state. Some states report adding up to 500 new ICs per year (see Question 4). Lack of IC Implementation. Nearly half (46%) of respondents indicated that lack of implementation was a reason for an IC failure that has occurred in their state (Questions 5). Undiscoverable ICs. In addition, 20% of respondents indicated that an undiscoverable IC (Questions 5) or a new owner being unaware of the IC was also a reason for an IC failure in their state. Flawed IC Implementation. States reported that other issues can arise from flawed IC implementation and may result in IC failure. Goals and objectives of the IC were not clearly defined and therefore IC success cannot be ascertained. Erroneous, incomplete, or unclear language results in over- or under-restrictive instruments, or reduced enforceability. The geographic areas to which the IC applies are not clearly delineated or identified and the IC does not apply to all current or future geographic areas that are or could be affected. Responsibilities for implementation, monitoring, and maintenance are not clearly assigned or defined. Legal issues related to ICs running with the land hinder durability. ICs do not account for common law or other applicable statutes within the state in question and therefore may not result in a restriction that runs with the land. The grantee or third party beneficiary of a proprietary control will not endure for the term of the IC, or is unable or unwilling to dedicate the financial, staff, and legal resources to maintain the IC. Other real property interests (such as liens, mortgages, easements or judgments) may be prioritized higher than the proprietary IC. In most states, each interest is prioritized according to the date on which it is recorded with the land record authority. Thus, during certain proceedings (such as foreclosure) another senior interest-holder (such as a bank) may be able to dispose of all other interests, including the proprietary IC, if the IC was recorded on a later date and has lower priority. A subordination agreement is a legally binding agreement in which a party holding a senior lien or other interest consents to a change in priority, behind the proprietary IC. Such an agreement should be completed and recorded with the IC to ensure that the IC survives foreclosure or other legal proceedings by other interest-holders. A governmental control is subject to periodic review, modification, or reauthorization by a local governing body, and therefore does not guarantee the permanence necessary to guarantee IC effectiveness. No financial assurance is provided to ensure long-term costs for maintenance, monitoring, and enforcement are covered. Intra-State Program Inconsistencies. Most states have adopted standard procedures and templates for their various IC documents to address many of these concerns. In some states, however, use of templates may not be mandatory, and legal review may be required. Programs within the same agency or state (such as leaking underground storage tanks, brownfields, wetlands, Comprehensive Environmental Response Compensation and Liability Act (CERCLA), and the Resource Conservation and Recovery Act (RCRA) were found to have different templates and differing standards for document drafting, review, and approval, as well as different overall IC implementation. UECA (Uniform Environmental Covenants Act) Enactment. Twenty-three states, the District of Columbia, and the Virgin Islands have adopted statutes modeled after UECA (ASTSWMO 2015). Only seven states surveyed reported using UECA. These acts establish the use of environmental covenants and, in doing so, address a number of issues relating to flawed implementation, particularly those that had hindered proprietary controls from running with the land to new owners. UECA statutes, however, do not address the monitoring of ICs or the larger set of IC program management topics addressed in this document. Existing IC Monitoring Approaches. States also reported on the methods they currently use to monitor ICs for IC compliance assurance purposes. Many states employ one or more IC monitoring methods, with periodic agency review (such as annual or five-year reviews) and landowner self-certification being reported most commonly, while One Call and other frequent land activity monitoring systems are employed by less than one-quarter of the states (see Table 1). State Suggestions for Improved IC Management Programs. Even though IC monitoring occurs in many states, states also reported the need for IC management program improvements. States specifically identified a need for improved IC monitoring in general and to a lesser extent for the monitoring of ownership changes at IC-affected properties. Table 2 summarizes these suggestions. Table 2. Summary of state suggestions for improved IC management. Alabama Electronic integration with local land records; align use restrictions with local zoning. Alaska Enact environmental covenants statute; build GIS registry; charge fees/bill property owners. Arkansas Develop a One Call monitoring program for ICs. Connecticut Require self-monitoring/reporting; use deed notice for low risk sites. Delaware Assign a dedicated team for monitoring. Florida Offer more frequent training for Agency staff. Hawaii Use One Call monitoring; landowner annual reporting; periodic audits. Idaho Improve monitoring; coordinate internal cleanup programs; IC funding mechanism. Indiana Develop a monitoring/LTS program. Iowa Establish tracking system; monitoring. Kentucky Improve mapping; ability to restrict abandoned property. Louisiana Develop an IC monitoring program. Maine Add shape files to registry; inspect IC sites; put old restrictions into UECA covenants. Michigan Require all ICs to be recorded; establish an IC monitoring program. Minnesota Improve pubic registry of ICs (GIS); track compliance. Missouri Improve IC locator map; implement centralized IC monitoring. North Carolina Develop centralized multiprogram IC database. Ohio Use more frequent regulator inspections. Oregon Develop systematic IC monitoring. Rhode Island More site audits of ICs. South Carolina Implement permit- like program involving compliance assurance, enforcement, and renewal. Texas Establish periodic IC monitoring/inspection. Utah Expanded One Call monitoring; more frequent monitoring (rather than being limited to five-year reviews). Utah Improve registry; require implementation plans; improve monitoring. Virginia Build an IC registry/ implement IC monitoring. Washington One Call monitoring; IC cost recovery. West Virginia Develop IC stewardship program; develop IC inspection form template. Wisconsin More site audits of ICs. Florida Improve property transfer notice compliance. Kansas Make sure new owners are aware of ICs. Minnesota Make sure new owners are aware of ICs. New Jersey Track new property transfers/make sure new owners are aware of ICs. Tennessee Make sure new owners are aware of ICs. IC Planning. In addition, 52% of survey respondents require some variation of a long-term stewardship or management plan for some ICs, in order to help assure IC success. Financial Assurance. Only 25% of the states surveyed have required financial assurance specific to ICs (see Question 12). The ITRC survey results largely informed the structure and emphasis of this guidance, which focuses on IC management programs needed to address the latter, stewardship phases of the IC life cycle. 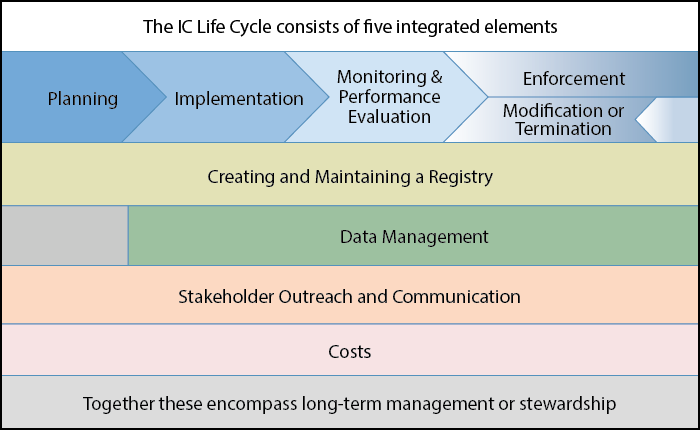 Figure 2 summarizes the IC life cycle and its relationship to the IC management program topics addressed in this guidance. The IC life cycle proceeds from planning through enforcement, with the monitoring and performance evaluation phase commonly covering the largest time span. Figure 2. Integrated activities in an IC life cycle. While not the focus of this guidance, the planning and implementation phases are critically important. The summary of planning and implementation presented in this guidance draws from various existing guidance documents shown in Table 3. Registry. After an IC is executed, the IC and its attributes are catalogued in a format that is available to all stakeholders. This catalog, also known as a registry, identifies applicable ICs for a parcel, site, or region. Stakeholders can then use this information to direct and plan the tasks associated with long-term stewardship. A registry that includes accurate and up-to-date geospatial data can also easily identify the geographic limits of the IC, even as the surrounding landscape changes. Data Management. Data management includes the activities and systems used to accurately record and share IC characteristics (such as geospatial, legal, and obligation details) and other information (such as monitoring, performance evaluation, and enforcement data). Data management also includes systems used to house documents retained throughout the life of the IC. Monitoring and Performance. The monitoring program includes the activities and information flow used to evaluate OP compliance and IC effectiveness. Government agencies, landowners, trusts, third party beneficiaries, and other groups or individuals can perform monitoring. The performance evaluation process assesses monitoring data and other information to determine the extent to which an IC is meeting its stated goals. Results of a performance evaluation can include reopening, terminating or modifying the IC, other types of corrective action, and enforcement action. Enforcement. Once a violation is identified through monitoring, inspection, reporting, or an IC performance evaluation, actions may be taken to a breach or other violation of IC terms. Actions can range from informal communications seeking voluntary compliance to more formal, legal action. Stakeholder Perspectives. Stakeholder outreach includes identifying and involving internal and external stakeholders throughout the IC life cycle. An effective outreach program acknowledges the interests of all potential stakeholders, while seeking input from and communicating to stakeholders during the IC process. Outreach includes information regarding the potential risks posed by the residual contaminants and proposed methods to avoid those risks, including ICs. The better educated the affected stakeholders are about the underlying need for restrictions, the more likely they will understand the site risks and abide by the ICs. Stakeholders may change over time as new information about the risks and alternatives become available. Costs. Often overlooked, the costs to implement an IC management program can be significant. The full suite of costs of the IC management program can be evaluated, and funding sources (such as up front or periodic fees or financial assurance) identified in order to ensure the proper long-term protection of human health and the environment that ICs are intended to provide. Each of these management program components functions best in concert with the others and supports various IC life cycle stages. An IC registry enables well-organized planning and execution of an effective monitoring program. The monitoring program, which includes the activities and information flow used to evaluate compliance and IC effectiveness, directly informs the performance evaluation process. Modification, termination, and enforcement occur as a result of the information gathered during monitoring and the assessment that occurs during the performance evaluation. Importantly, neither performance evaluation nor enforcement can function properly without a monitoring program and registry. Stakeholder coordination and outreach provide additional information that may be used for performance evaluation, monitoring, and enforcement, as well as addressing IC problems. A data management system encompasses all of these components, from housing an electronic registry to incorporating monitoring, assessment and enforcement data, as well as making some portion of the data available to stakeholders and the general public. Finally, none of these components is feasible without funding sources for short- and long-term costs.